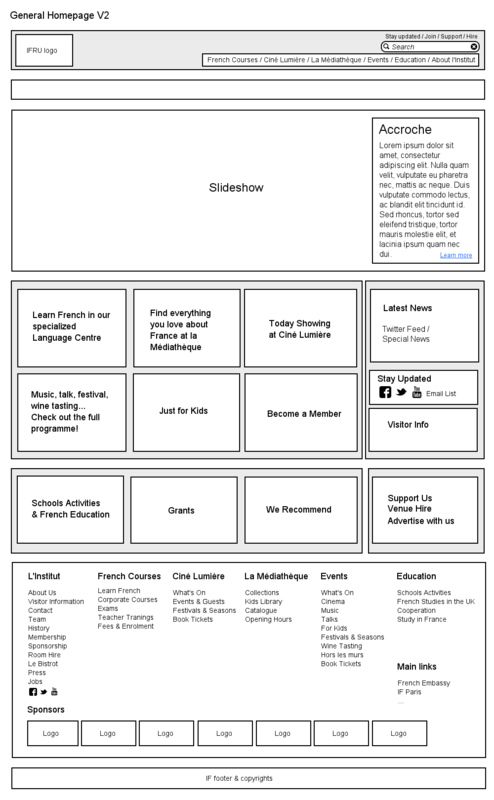 For several reasons (see Background below) a complete redesign of the French Institute website has been decided. I worked over 6 months (1 month development) as the sole designer and developer, with over 12 stakeholders, to analyze, design and develop a new version of the website. The institute has a very wide range of activities : language learning, cinema, library, music, classical music, arts, talks, kids events, festivals, school activities, education cooperation, higher education, cultural cooperation, room hire, sponsorship. The project started with a meeting with the Head of Marketing, to clarify why a redesign was wanted on a marketing & identity level. We established that for this part the priority was to present the institute as a commercial, independent, multi-disciplinary cultural venue while keeping an institutional dimension. And the second main priority was to restore a better balance between the departments (on the former website, only the events were really highlighted). Depending on the department size and the state of the former web sections, the process could vary between 3 days and 3 months. For some departments a very useful solution was to meet the team members who are directly in touch with the users, for example the language centre receptionists, because it enabled us to have real and unbiased feedbacks on users behaviours and it was of great help to identify the users types. At the same time I worked on ensuring a general consistency through the different sections, and once the goals & architecture were validated by the main departments and the marketing, I presented the project to 20 key stakeholders. I presented the wireframes of the language centre, cinema, events calendar and library which are the main commercial / cultural departments. And I also presented two possible versions on the homepage. The main issue with the former homepage was its lack of obvious hierarchy. There was three menus without a clear sign of their relation or hierarchy, and over 25 different items. The new version has been released in December 2012. Since then the general traffic has augmented of 30% and the number of pageviews of 60% (45% and 80% for critical sections). 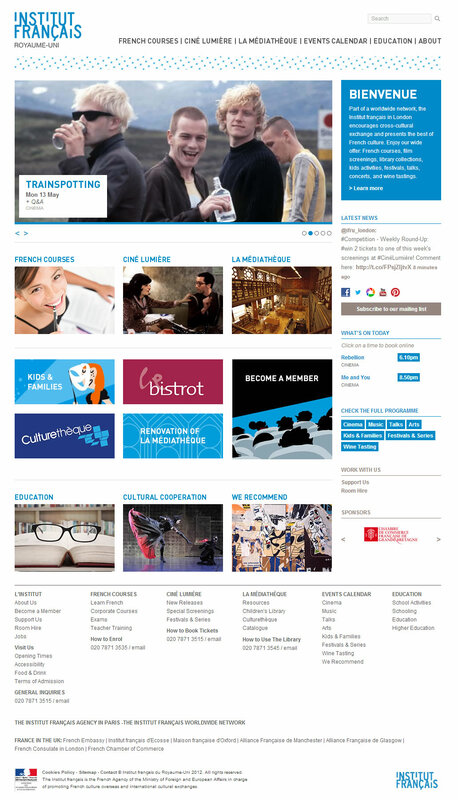 Some departments are seeing a direct impact on their activities (clear increase of online bookings for school activities) and some other French institutes in the world are interested by the features and design of the website.